Pity the poor History Channel. They have the unenviable task of making history entertaining. They seem to have succeeded by focusing on the military aspects of history and thereby catching the action-oriented adult male audience. And since much of what we know as history is old war stories, there was already a built-in military bias to their fare. History has this military aspect because so many turning points and watersheds happen in times of war. But as professional historians quickly learn, for every war there is a larger back story of human political, social, and economic origins to that war. However, if THC were to start in on Alexander Hamilton’s banking theories for Colonial America, the average viewer’s eyes will glaze over and the viewers will wander off to another channel to watch kick-boxing. So the pressure remains to program only the action aspects history and that’s usually warfare. With an archive of thousands of hours of combat film footage from 20th-century wars, the History Channel found itself in a cul-de-sac of success by becoming in the eyes of many “The Hitler Channel,” because of the numerous shows about WWII and the Fuhrer. This problem didn’t originate with THC, as one of the first and longest running TV success stories was Victory at Sea, a 1952 documentary series about naval war during WWII. After Victory at Sea came the 1957 documentary series The 20th Century which also consisted largely of WWII combat footage (although to broaden its scope, older primitive footage from WWI was dredged up; to give it a more educational flair, some political topics from between the World Wars were covered). Often the episodes would be, one way or another, about Hitler, and there we are back to WWII again. THC has soldiered on by diversifying its portfolio with wars from Hannibal to Cromwell to Grant and Lee. There is now a dedicated Military History Channel and forays into grand scale engineering; what might be considered as the War Against Nature. These days,THC is less ‘The Hitler Channel’ but still remains essentially Guy TV. So it was with reservations that I watched a promo DVD of THC’s project on George Washington’s military life entitled Washington The Warrior. I’m happy to report from the front lines that Washington the Warrior is good viewing and pretty good history. By staking out the ‘Warrior’ territory as the topic, THC stays true to its niche and sidesteps major political and social themes (notably Washington the President). While this may make the professional historians sputter (but then what doesn’t?) Washington the Warrior avoids getting mired in non-action activities. That’s stuff for Ken Burns and PBS, and I think we all understand that. 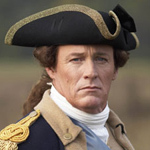 Washington the Warrior is presented in the standard historical documentary style of talking-head experts interspersed between reenactments voiced over by a narrator. The text is intelligent and informative, though not in-depth because of the time constraints. This would be an excellent introduction not only to George Washington, but to pre-revolutionary North America and the Revolutionary War itself. The classic telling of the Revolutionary War is often centered in the north, on Concord and Lexington but Washington the Warrior covers the variable fortunes of the war in the southern colonies as well. To their credit THC has slipped in some of the political backstory, so Washington the Warrior is more than just battlefield tactics. They’ve humanized the men involved, Washington in particular. They try to make the historical figures real people, and not pieces on a chess board. They show that real people die in battles. This realism is a fashion of our time (see also Saving Private Ryan and Band of Brothers), something the modern audience expects. Washington’s mistakes are neither ignored nor glossed over. He is shown as being fallible and is not made into some kind of mythic or divine figure. His home life is mentioned, though that may be the point in the program when many of the battle-jocks leave to get another beer. Give the producers credit for taking a chance with that. Where Washington the Warrior really shines is in the production values, and this tells me that this is also something the modern audience demands. Lacking original footage from Washington’s day, it must be invented from scratch, and in this THC has done a good job. The look is part CGI and part re-enactor dress-up, with admirable attention to detail. I’m not an expert in these matters but am willing to believe that the number of buttons on the Continental Army uniforms is correct. Also, I was put in mind of some of Stanley Kubrick’s Barry Lyndon, the benchmark of 18th-century cinematic imagery. The candle-light scenes, the battle POVs and meticulous costumes are all there. What’s not there is dialogue, which keeps with the tradition of battlefield documentaries. You don’t hear General Eisenhower speaking to General Montgomery at Normandy, you only see him speaking. Washington the Warrior presents mock archival footage, not theater. The goal is to present a documentary as if this is what you would have seen as the cameraman for the Continental Army. Also missing is any mention of Washington as a slave owner. They just didn’t go there at all. Not mentioning it is almost as big a deal as making a big deal about it. I think this was an error in judgment or submission to political pressure, and I wonder at what point that sequence ended up red-lined or on the cutting room floor. Yet despite that, there are fleeting images of black soldiers in the Continental Army. Had this program been made in the 1950s that would have been unthinkable, despite the undisputed reality of blacks fighting in the war. Perhaps this is the baseline of current audience acceptability. We cannot acknowledge Washington was a Virginia slave owner, but we can show, if only for a few frames, a couple of black soldiers. Perhaps the main point to the exercise is Washington’s retirement from the Continental Army at the end of the war. Despite being non-battlefield territory, this angle is given a fair share of air time. The case is made that, over the course of his life, Washington was destined to lead the Army and then to have the personal character to not become the dictator of the newly independent colonies. It is a happy and non-military ending for all of us in the United States today and a thoughtful and satisfying ending to Washington the Warrior.